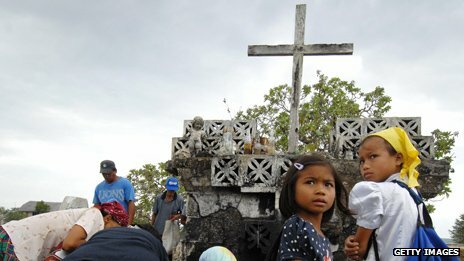 It is not a question I had ever thought to ask before, so I rang the Siquijor tourism department to see if they were able to help. "We don't have any witches," was the first reply, which did not seem all that promising. But after a bit more discussion, it seems that Siquijor's witches - well, the good ones anyway - have recently undergone a rebranding exercise. They are now called traditional healers. But what about the bad witches, I asked? "Oh we don't promote them," came the rather sensible answer. So, armed with a list of approved witches, I set off. My first call was to a woman who is by far the most famous healer on the island. At 86 years old, Consing Achay is the only person still practising bulo-bulo - a technique to remove evil spirits. Her heavily-lined face reflects the ancient history of her art. Murmuring a special language, she adds a small stone to a glass of water then moves it around her patient's body, blowing air into it through a bamboo straw. The water gradually becomes cloudy - apparently that is the sickness coming out. She then repeats the ritual, continuing until the water stays clear - which took three attempts in my case, making me wonder just how many bad spirits had been attacking me recently. Consing is not quite what I imagined a witch to be. She is devoutly Catholic and sees no contradiction between her religious faith and her traditional spells. In fact, she says she received her powers from the Christ child in a dream and she does a quick sign of the cross before starting each treatment. She does have a black cat, but it did not seem to have an essential role in the proceedings - it fell asleep behind my chair during the treatment - and her consultations are held in a small room behind her son's karaoke bar. Francisco Aladad is even more of a contradiction than Consing, because he is essentially living the life of a modern Filipino. When I visited, he was just having a new window fitted. A motorbike was parked by the porch and a scarf with the word "Holland" emblazoned on it was pride of place on the wall, a gift from his daughter's Dutch husband. 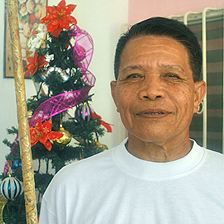 But Francisco's most important possession is a large stick, which he claims can identify bad spirits. He believes these spirits are everywhere - on the side of the road, floating around in the air and even under the ground - just waiting to get into people to cause illness of body or mind. Francisco says they are the ghosts of the dead or fallen angels. On the opposite side of the island, another family is also busy tackling evil in a different way. Dios Dada proudly showed me her father's herbal potions which, since his death, she alone can administer. These ointments are only made once a year - more than 150 different types of herbs and tree roots are needed, and all of them must be gathered between Ash Wednesday and Good Friday. They are then rubbed into the affected areas of the patient's body through a cloud of smoke to ward off yet more of these ever-present bad spirits. By this point, I was wondering what it is that makes Siquijor so full of malevolence. After all, the palm trees swaying softly in the wind, the sun-drenched paddy fields and the white sand beaches seem anything but threatening. Perhaps it is because, despite the government's rebranding efforts, almost all the healers I spoke to said that bad witches did still exist, putting curses on people out of jealousy or rage. Or perhaps it is the more practical reason suggested by Francisco - that because the island did not have its own hospital until recently, traditional beliefs about illness and disease have stood the test of time. Or perhaps it is just a fiction that has been repeated down the centuries to become the stuff of myth and legend. But if so, the queue of people waiting for treatment from Consing shows it is a myth that is very much alive today. As for whether I believe it, well, it is better to be safe than sorry. If I had any bad spirits living inside me, the good witches of Siquijor have hopefully sent them on their way.